The saying goes, “Everything’s Big in Texas” and that is definitely the case when it comes to Christmas lights. Thousands of families view travel throughout Texas searching for the best holiday light displays, but those living in Dallas only have to travel a few miles for some holiday cheer. If you’re looking for “must see” Christmas light decorations here is the locations you need to add to your list. Located just a short drive outside of Dallas is Texas’ favorite drive-thru Christmas destination! Santa Land is a park with over 24 acres filled to the brim with Christmas lights, in fact there are over 2.5 MILLION lights! That’s right multiple millions of Christmas lights in every direction. and that doesn’t include the 250 foot tunnel of lights you can drive thru. The folks at Highland Park Neighborhood know how to celebrate Christmas, in fact they’ve been doing it for over 40 years! The family fun tradition of looking at Christmas lights continues as the beautiful mansion filled area is decorated from home to home. You’ll help your children develop lifelong memories by starting at Armstrong Parkway and simply getting among the lights. Another great area to enjoy for Christmast lights, especially if you’re a fan of Dallas’ skyline is Kessler Park Holiday Lights. Five large colorfully decorated Christmas trees are planned out annually by volunteers from the neighborhood’s planning committee. Overlooking the neighborhood is a great view of downtown Dallas which adds quite a beautiful landscape while looking at Christmas lights. 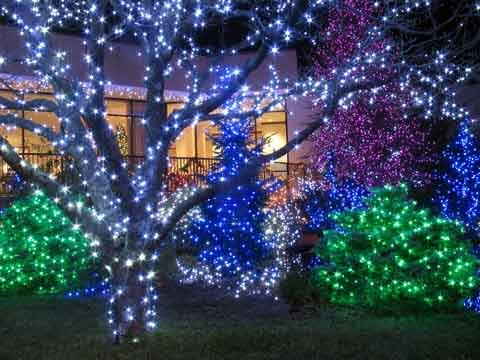 This neighborhood offers some serious holiday spirit with multiple homes decorated with lights that won’t disappoint. The famed Farmers Branch Christmas Tour of Lights has been a must see for families for years upon years, but expect a few new things this year. The Farmers Branch Tour of Lights is literally taking a new turn by changing up the route, and have added a brand new synchronized dancing light display set to traditional Christmas music. Plus, guests will be able to say thanks to the many non-profit community members who help staff these projects. Normally when people think about looking at Christmas lights they get in their car and drive around the neighborhood, but one of the most beautiful Christmas trees in the country sits right at Dallas’ Galleria ice rank. Hundreds of thousands of shoppers flock to the to the Galleria Dallas shopping mall to find the perfect gift among their more than 200 world-class stores, but everyone makes a special stop to watch the Grand Tree’s Lighting Celebration! Plus, you can come back and do a little ice skating yourself while enjoying the Christmas lights.